The final installment of how innovation in bulk materials handling is helping Fortescue to reach its planned 155 mtpa goals. Click here to read Part One, and click here to read Part Two. Hydraulically-powered train holding devices are located at both the inbound and outbound sections of the unloader. Four sets of wheel locks are located before the tippler entry and six sets of wheel grippers are located after the tippler exit to prevent movement of the two ore cars being unloaded. Each set of holding devices is powered by its own hydraulic power pack. According to Fortescue's Shirley, the system provides lots of flexibility, along with failsafe measures to protect staff as well as guarding against downtime and production loss. "It's certainly very easy to utilise the redundancy that's provided by the new train unloaders by simply switching from one to another. Each train unloader is able to link with at least two stackers, providing operational flexibility. This is one advantage of having the three up and running," he said. "What we want to do is keep train unloader three in a ready state so that within 24 hours we can fire up and run it if we need to. So certainly the arrangement that we have provides a lot of flexibility." Safety is a top priority for Fortescue, and the team has worked with Metso to ensure maintenance personnel are kept out of harm's way. "Our scheduled shut-down happens every 12 weeks where we'll go in and do work, which is mainly driven around the conveyor belt maintenance and chutes," Shirley explained. "We have trialled a new idea with TU602 & 3 where we've located the hydraulic power units off-board - on TU601 they're actually on the tippler cell itself which creates a few maintenance issues. So we've taken the power packs off the tipplers and we've just got hoses running to them now. "This means the maintenance technicians no longer have to go on the tippler itself, meaning a couple of the major hazards we had identified in our business are completely removed. With safety our number-one priority, the associated safety benefits are significant." Co-ordinating the three parts of the train unloader with their myriad of sensors, motors and hydraulics has been accomplished through the use of a GE Fanuc RX3i PLC. The motor starters, VVVF equipment and associated I/O are located in the switch room. The field I/O located around the plant is connected back to the PLC by Profibus fibre optic. A GE Fanuc Cimplicity SCADA terminal in the unloader's control room provides SCADA displays of plant status. While the automation of each train unloader is rather complex and is managed by a standalone system, each train unloader also has to co-ordinate with the control of the other port equipment such as apron feeders, conveyors and stackers. "Our process has to be highly automated because we run very lean structures. The more we can automate the better. We're certainly on the bleeding edge of that technology. The automation platform is GE and it's all Ethernet connected, so there's massive capability there; we can set-up remote condition monitoring at these locations and have it all reporting to a central data centre," Shirley stated. On-site, Fortescue employs a process control team resourced with a lead, process control engineers, and on-shift technicians. One operator and one electrician together run an entire train unloader asset, while the train circuit itself is controlled from an integrated operations centre in Perth. 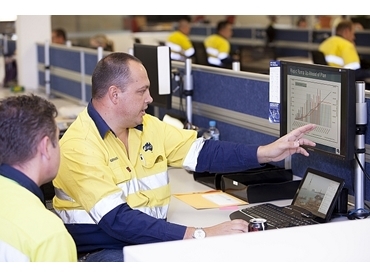 Two operators are responsible for inload and outload duties at the operations centre in Perth; this includes managing the activities of the on-site operators, such as directing who attends issues as they arise on the circuit. "Two operators and two electrical technicians are on-site on a 24-hour basis. But essentially the system is all controlled out of Perth, so the role of our site staff is to do inspections and to provide rapid response if there is an issue. We can direct them very quickly and they can attend to the issue and get it resolved in the shortest possible time." Fortescue director of development Peter Meurs said the commissioning of TU602 was a major milestone for the company as it continues its expansion to 155mtpa. "The second train unloader takes our unloading capacity to 120mtpa, which gives us the capacity to reach a run rate of 115mtpa by the end of the March 2013 quarter, comprised of 95mtpa from the Chichester mines and 20mtpa from Firetail," Meurs said. "The third train unloader will give us inloading capacity well in excess of the 155mtpa we need for our current expansion project."